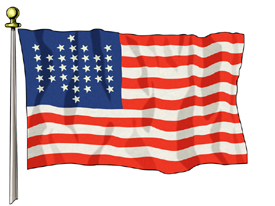 Historical Flags of the United States continue on Page I and Page II. There are many, many versions of the Great Star flag. This flag flew over the Capitol dome for at least six months of 1818. This flag was designed by Captain Samuel Chester Reid of the U.S. Navy. Congress adopted both his 13 stripes idea and the idea of adding a star for each future state. These flags represent the Vikings reverence for the raven. When making long voyages Vikings took along ravens and released them. They would fly in the direction of land leading the Viking to safety. Thorifinn Karlsefini, brother of Leif Ericson, probably carried this banner to the New World in 1003 A.D.
Once ashore San Salvador, October 12, 1492, Columbus broke out this flag with which to claim the new world for Spain, hence it became the first flag to fly over soil in the Americas. The flag represents a Spain newly united under the royal houses of Aragon (the rampant lions) and Castile (the castles). This was the flag of the early colonists who had joined together in the protest against the British impositions on American economic freedom. In 1767, the Sons of Liberty adopted a flag called the "Rebellious Stripes" with nine uneven vertical stripes (five red and four white). It is supposed that nine represented the number of colonies that were to attend the Stamp Act Congress. 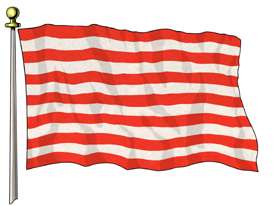 A flag having thirteen horizontal red and white stripes, used by American merchant ships during the war, was also associated with the Sons of Liberty. On December 16, 1773, the Sons of Liberty protested the Parliament's Tea Act, an action that became known as the Boston Tea Party. Ours is 3'x5' outdoor nylon having thirteen horizontal sewn red and white stripes. The Taunton Flag was one of the earliest of the colonial flags, first raised in 1774 at Taunton, Massachusetts. It was simply the Queen Anne Flag with the words, "Liberty and Union" sewn onto the red field. The Boston Evening Post reported the incident and the idea caught on. Flags with identical or similar mottos began to appear throughout the colonies soon after. General John Stark of New Hampshire commanded a militia brigade known as the "Green Mountain Boys". This Flag is also known as "Stark Militia Brigade Standard". Tradition relates that its green flag was flown at the Battle of Bennington on August 16, 1777. As in many American flags, the stars here were arranged in an arbitrary fashion. Nevertheless they signified the unity of the Thirteen Colonies in their struggle for independence. This troop was formed by wealthy Philadelphians who supplied their own uniforms, horses and equipment. In June of 1775 they escorted Washington from Philadelphia to Cambridge, Massachusetts to take command of the Army assembled there. The flag was later carried into battle at Brandywine, Germantown, Princeton and Trenton. One of the interesting things about it is the fact that the original was hand painted. The 33 Star Garrison Flag that flew over Fort Sumter has been called "The flag that started a war." At the outbreak of the Civil War (1861), the US Flag had a field of 33 stars representing 33 states. 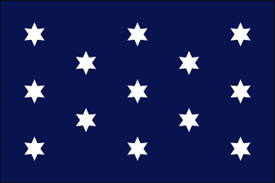 President Lincoln refused to remove the stars representing those states which seceded from the Union. 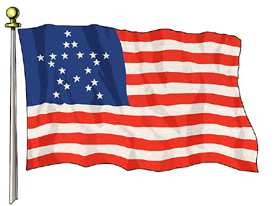 From the first 3 months until 1863, the flag had 34 stars. In 1863, West Virginia separated from Virginia to join the Union. Consequently the Union flag had 35 stars until the close of the Civil War. This flag was used by George Washington on his squadron of six schooners which he outfitted at his own expense in the fall of 1775. This flag was a variation of the New England Pine Tree flag. It was later modified and adopted by the Massachusetts Navy. The Sons of Liberty would rally under a large tree, in Boston Massachusetts, which came to be known as "The Liberty Tree". This tree became a symbol of American independence. Knowing they were up against a great military power they believed they were sustained by still a greater power, thus their "APPEAL TO HEAVEN". This was the personal flag of George Washington in 1775 during the Revolutionary War. A reproduction of this flag flies at Washington's Headquarters in Valley Forge. Contrary to what many think, this isn't a revolutionary flag, but was in use a hundred years before then, as a symbol of New England in general and Massachusetts in particular. Once war broke out, it was swiftly adapted by the Americans in various forms, and in April of 1776, it became the official flag of the Massachusetts Navy. Additional products to be featured on this page in the near future. Return to Historical Flags Page I or Page II.